It’s just over two years since Michael Conlan stood in a ring in Rio de Janeiro, and lost his mind having lost a fight. He’s lucky he’s gone pro, for what’s happened since has dragged the bar lower and lower again. We’ve had the cheating that the brilliant Belfast featherweight suffered from and that saw 36 referees and judges suspended from the Olympics. We’ve had the corruption that saw millions upon millions go missing and the association left practically bankrupt. This time what’s alleged is linked to big time criminality. The latest issue to hit the AIBA came last Saturday in Moscow with the election of Uzbekistan’s Gafur Rakhimov as president, which leaves amateur boxing and all of its athletes – including our gold medal hopeful Joe Ward – potentially on the outside, looking in, come the 2020 Olympics. That is the severity of the situation. The Irish association confirmed on Friday that their vote went to beaten Serik Konakbayev from Kazakhstan after previously not responding to questions on the matter, which in turns raises more questions as to their initial silence. Granted in a press release today they stated it’s “unusual for the IABA, as is the case with most national federations, to reveal how they voted in an election, but given the intense commentary surrounding this particular election it was felt by the board of directors and central council, that it was in the best interests of Irish boxing to do so in this instance”. If what they’re claiming is true, and we can only take them on their word, then at least they are on the right side of a decision that isn’t so much a sporting tragedy as a serious blunder. Ladies and gentlemen, in the red corner, Gafur Rakhimov. On Friday last, before that election took place, the executive director of the AIBA, Tom Vignets, was speaking. Accounts had just shown how the association had negative equity of €16.7m, had assets valued at less than €3.5m, and how in any other sphere of business, the padlock would have already bolted the door closed. “It is an ugly, ugly figure,” said Vignets. What he failed to mention though was that their saviour was also an ugly, ugly figure. So money or morals? Twenty-four hours later, the AIBA emphatically made their decision. Rakhimov has had an interesting path. In the fledgling Uzbek nation he was involved in bringing vital supplies into the new country, gaining him friends in high places. That allied to a love of boxing later saw him supply amateur boxers as bodyguards for the political hierarchy. Back in 2000, he was refused entry to the Sydney Olympics due to alleged mafia connections, and they’ve never gone away. By 2012, during attempts to reprimand him, the US Treasury Department noted that he is “a key member of a Russian-Asian criminal syndicate with a speciality in the organisation and the production of drugs in the countries of Central Asia”. By December last, the Treasury did manage to have him black-listed, meaning US citizens and companies are no longer allowed to do business with the new head of amateur boxing, as they named him one of his country’s top criminals. In fact on 22 December, the details were released on their official website. They showed him with a villa in an upmarket area of Dubai, and with a high-end apartment in a Moscow skyscraper; they showed him as having a Russian passport and five Uzbek passports; and crucially, they showed him as “Linked To: THIEVES-IN-LAW”. The treasury department went on to describe Thieves-In-Law as “a multi-ethnic criminal group largely based in countries of the former Soviet Union but extending to the Middle East, Africa and Latin America.” For perspective, within law enforcement documents, they are grouped with three others. The Camorra, the Yakuza and Los Zetas. That’s some company. A press release that same day last December from the Treasury referred to Rakhimov specifically and directly as “being designated for providing material support to the Thieves-in-Law. Rakhimov has collaborated with Thieves-in-Law on business, as well as assisted Thieves-in-Law by providing warning of law enforcement issues, arranging meetings, and addressing other problems. Rakhimov has been described as having moved from extortion and car theft to becoming one of Uzbekistan’s leading criminals and an important person involved in the heroin trade”. He has always denied all links and is fighting to clear his name. But there is nothing new in the whispers and even out-and-out shouts around the 67-year-old. Go back to the awarding of the 2014 Winter Olympics to Sochi and he was seen as a key player in getting votes in his role as Asian Olympic Council vice-president. Sergei Kanev, an award-winning investigative journalist spoke in 2014 of the photos of Rakhimov and a local Sochi mafia boss, before the murder of the latter. Kanev also said Rakhimov wouldn’t help if there was nothing in it for him from Vladimir Putin. He was later thanked by their Olympic committee for his “single-minded work in delivering votes”. Craig Murray, a former British Ambassador to Uzbekistan who was removed after highlighting how torture was used there to extract information passed onto the CIA, went further. He has described him as “one of the four or five most important people in the heroin trade in the world. He is absolutely a very major and very dangerous gangster”. There are those, however, that point to a confusion due to Rakhimov and his nation’s troubled history. Uzbekistan was seen as one of the most repressive of the former Soviet nations and it had more political prisoners than the rest combined, even engaging in a Tiananmen Square-style massacre in 2005. More recently the daughter of former dictator Islam Karimov turned on many of the wealthy citizens, a move that saw Rakhimov flee to Dubai and leak information on human rights abuses and the rulers to aid agencies. Some saw him as a victim, others not so, and while one person close to him says they defended his right to not be extradited and face torture, that’s where Uzbekistan’s defence of his past, present and future ended. With Shavkat Mirziyoyev taking power in Uzbekistan in 2016, his is a less harsh authoritarianism that has sought to bring back in and rehabilitate many of the former criminal leaders while building relations with Russia. Many say this is where Rakhimov comes in. But regardless of internal complications, externally this ought to be clear cut. Regardless of real-life contradictions, in a sporting sense it’s quite obvious. Boxing would have done well to stay far, far away. Let’s be charitable and describe the AIBA in the years leading up to all this as grimy. Their dire financial position came about largely due to a scandal around a loan it received from a construction firm in Azerbaijan. Not only was it never repaid, but 45% actually went missing. The loan was agreed by former president Wu Ching-kuo who claims he has no idea where the money went, although the AIBA executive board has sought to ban him for life for “gross negligence and financial mismanagement”. Meanwhile, when Price Waterhouse Cooper were called in to audit the books, they suggested the federation get a criminal lawyer. 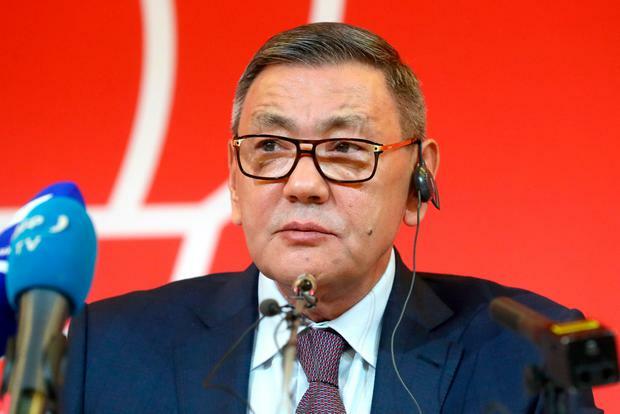 Wu left in November of last year, by December Gafur Rakhimov was punished by the United States authorities, yet by January the opening presented by the former still allowed the latter to step up from vice-president of 15 years to the top role temporarily. It was a rough start for him. On 4 February, IOC leader Thomas Bach said that they’d be looking into the governance, the corruption and the anti-doping measures as Russia had been let loose in that sphere. On top of that, they’d suspended vital funding from Rio. Rakhimov’s goals were to clear up the mess in terms of people and profit, and he still talks about how he restructured huge debt, turned bad loans into sponsorship deals since taking charge, and how he has wiped out other portions of finance owed. Granted, he has refused to detail how all this was done. Money saved, but the question is – at what price? Looking for reform, his history of being in the inner circle during so much corruption, and his history given the serious allegations outside of sport, left the IOC unimpressed. It left Bach suggesting that he was “extremely worried about the governance of AIBA” and how they “reserve the right” to remove boxing from the Tokyo 2020. It couldn’t have been more clear-cut. Basically, give him the job full-time and boxing was on the ropes. It was against this backdrop that last week the Irish delegation of president Dom O’Rourke, CEO Fergal Carruth, and secretary Art O’Brien made the trek to Moscow. They knew the stakes and since then (Before Friday’s statement) Independent.ie tried to contact Carruth and the association itself with four questions. 1. Was the IABA instructed on how to vote? 2. Will the IABA confirm or deny reports that they voted for Gafur Rakhimov? 4. Olympic threats of expulsion aside, what is the IABA view on Gafur Rakhimov? Friday’s statement has clarified their position, a welcome decision from a bumbling organisation that in the past had high performance chiefs pay for equipment and toilet roll for the cleaner, had those behind their evolution buying tickets at Olympics to go watch their fighters, removed Billy Walsh so ruthlessly, and failed to tap into their sponsorship potential. But why would they wait so long to clarify what is the right position? Why would their silence allow fuel to be poured into the embers? And as per their statement, why were they unaware of Rakhimov’s reputation given the US Treasury findings are in public? The IOC will though, and will likely make a call at a meeting this month in Tokyo. It’s then and there that boxing might well get back into the Olympics somehow, possibly without the AIBA. Whether it should though is a different matter given what the sport as a whole arrogantly, stupidly and immorally has gone and done.